Isaiah Bess, Trevor Lyford and Justin Larry, along with the rest of the Penquis Valley Patriots, carry their gold ball for fans after their 61-54 victory over Boothbay Regional High School to take the Class C boys state championship at the Bangor Auditorium Saturday night. Penquis Valley's Derrick Johnson takes a shot over Boothbay defender Linc Simmons in first half action of the Class C boys state championship game Saturday night. 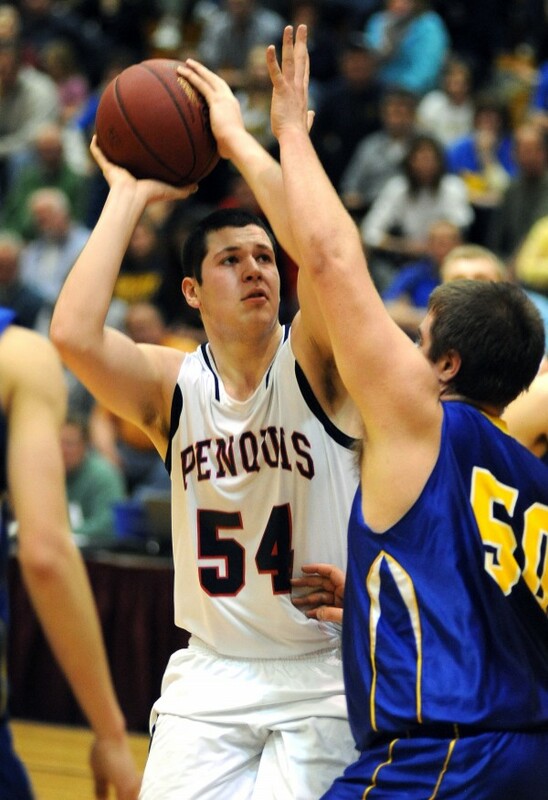 Penquis won the game 61-54 in the final tournament game held at the Bangor Auditorium. Penquis Valley's Trevor Lyford celebrates with the crowd after defeating Boothbay to clinch the Class C boys state championship Saturday night. 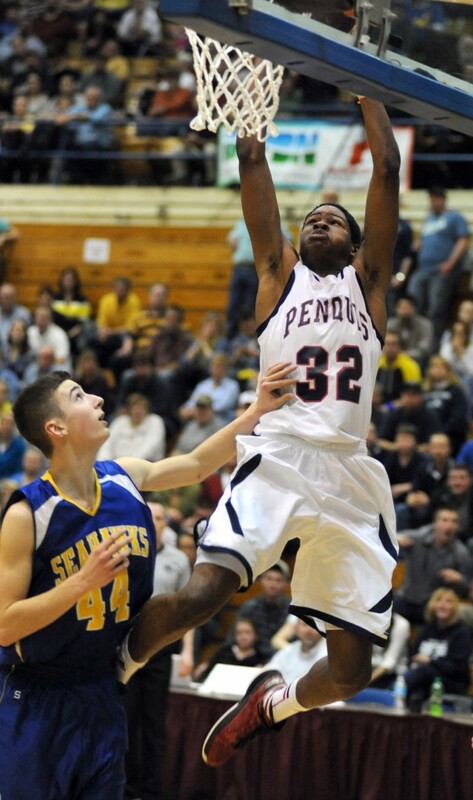 Penquis won the game 61-54 in the final tournament game held at the Bangor Auditorium. 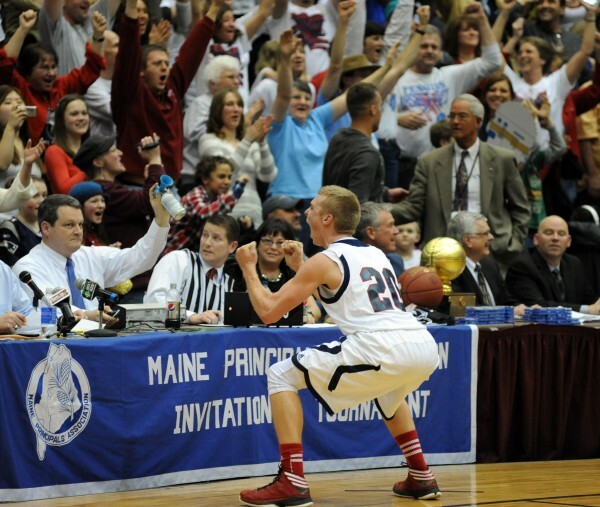 The Penquis Patriots celebrate their Class C state championship victory over Boothbay Regional High School at the Bangor Auditorium Saturday night. Penquis won the game 61-54. Penquis Valley's Isaiah Bess celebrates a shot with teammate Cody Herbest during first half action of the boys Class C state championship game at the Bangor Auditorium Saturday night. 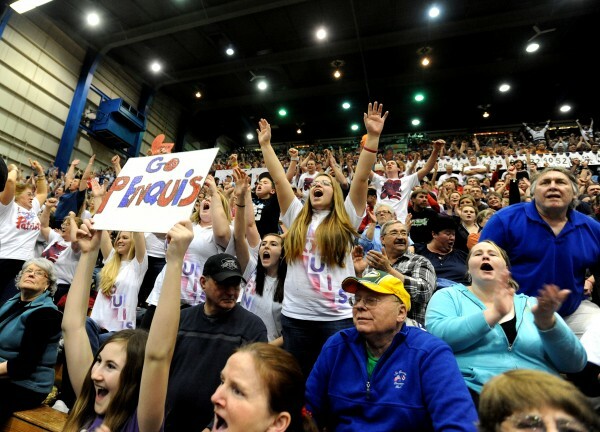 Penquis fans cheer for the Patriots during first half action of the boys Class C state championship game against Boothbay at the Bangor Auditorium Saturday night. Penquis Valley's Isaiah Bess dunks during first half action of the boys Class C state championship game against Boothbay at the Bangor Auditorium Saturday night. 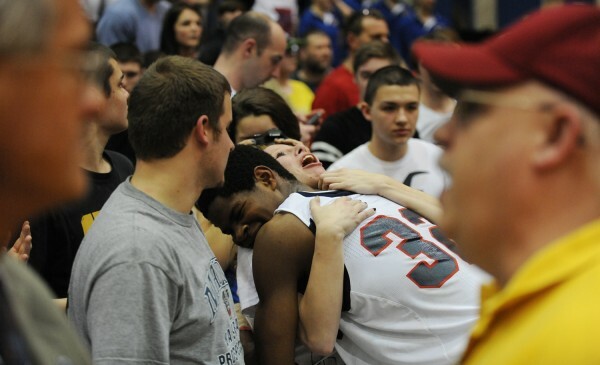 Penquis basketball guard Isaiah Bess hugs Penquis junior Jessica Prebble after the Penquis boys basketball team defeated Boothbay Region on Saturday for the class C state chamionship, the last high school basketball tournament to be played at the Bangor Auditorium. A Penquis basketball fan holds a sign on Saturday to wish the Bangor Auditorium farewell during the last high school game to be played at the arena which is slated to be demolished later this year. Penquis defeated Boothbay Region to take the class C boys gold ball back to Milo. High school basketball fans leave their seats as half time begins during the Penquis-Boothbay Region class C basketball title game, the last MPA tournament game to be played in the Bangor Auditorium before it's torn down later this year. 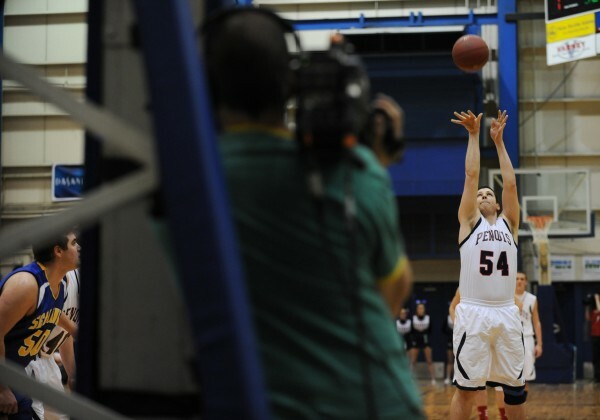 Penquis forward Justin Larry puts up a free throw from the foul line during the class C state championship game on Saturday at the Bangor Auditorium. Larry would be one of just a handful of student athletes that can boast that they played in the last high school tournament game at the facility, which is slated to be torn down later this year. Penquis guard Isaiah Bess and Boothbay's Anthony DiMauro tip off during the class C state championship game on Saturday at the Bangor Auditorium. 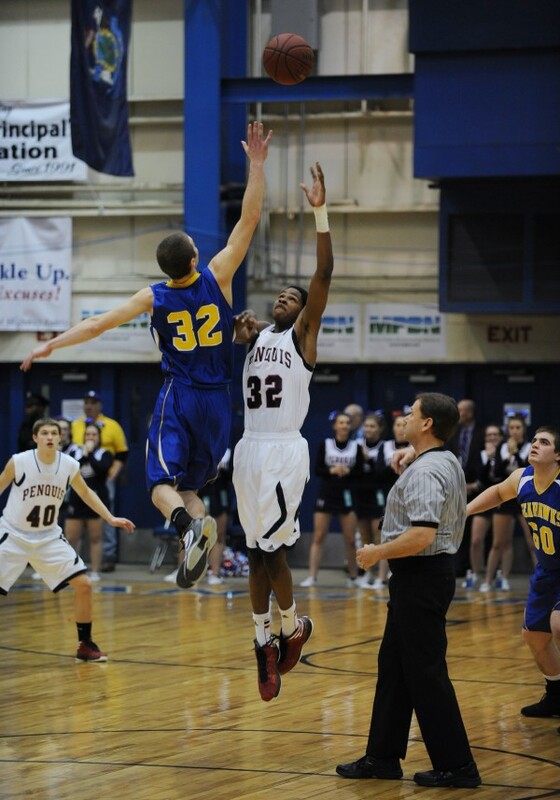 This was the last jump ball during MPA tournament action at the Bangor Auditorium as the building is to be torn down later this year. Bangor Auditorium maintenance technician Brian Miller hangs the last net to be used in a MPA basketball tournament at the Bangor Auditorium. The aging facility is being replaced by the Cross Insurance Center later this year. 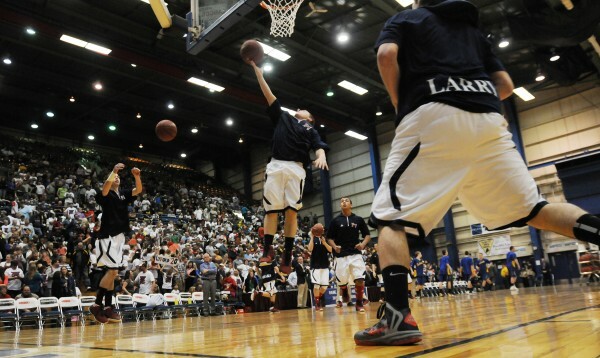 The Penquis boys basketball team warms up before the final MPA high school basketball tounament game, the class C state championship on Saturday at the Bangor Auditorium. The aging facility will be replaced by the Cross Insurance Center later this year. 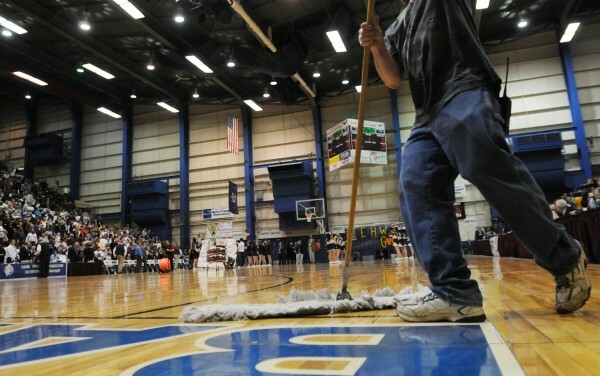 A final sweep of the floor by a maintenance technician readies the playing surface for the final game of high school tournament action at the Bangor Auditorium on Saturday. The aging facility is to be torn down later this year. Penquis forward Cody Herbest kisses the gold ball that he and his teammates earned by defeating Boothbay region High School in the class C boys state championship on Saturday at the Bangor Auditorium. 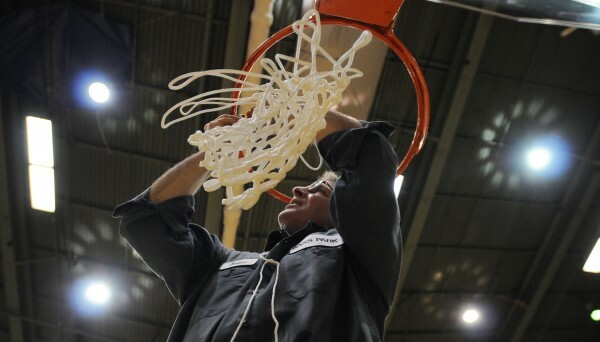 Herbest and his fellow team mambers were the last team to take a gold ball off the floor as champions. 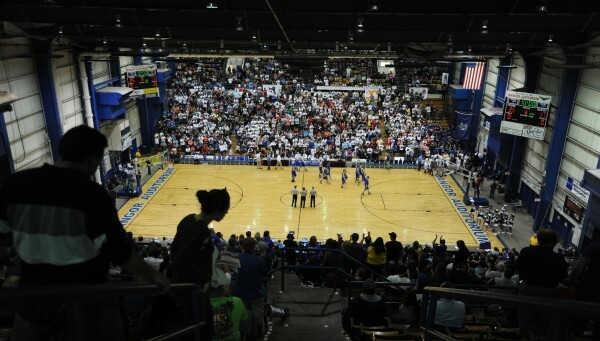 The hardwood was pulled up after the game and the facility is slated to be torn down later this summer. Some events, including the Harlem Globetrotters, will still utilize the auditorium until the new Cross Insurance Center is completed later this year. BANGOR, Maine — Basketball fundamentals often are lost amid the modern version of the sport that features offense dictated by the 3-point arc and steadily declining shooting percentages. 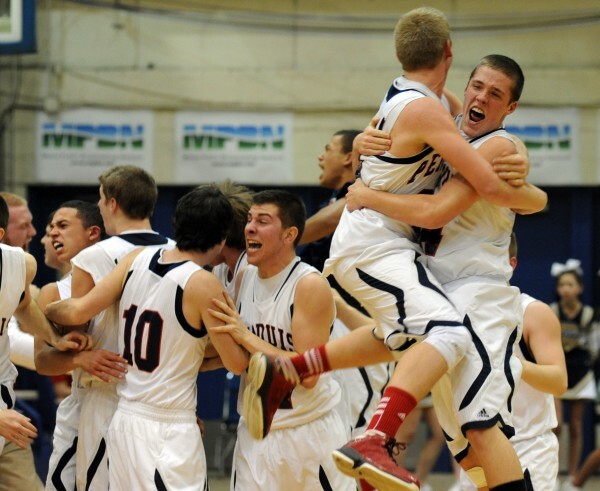 Long-range shooting did get the Penquis Valley boys basketball team off to a fast start Saturday night, but it was the Patriots’ defensive detail and ability to convert free throws that ultimately enabled them to strike gold. Isaiah Bess scored 27 points and Trevor Lyford added 20 — including a 12-of-14 effort from the line in the fourth quarter — as Penquis outlasted Boothbay 61-54 to win the Class C state title in the final tournament game to be played at the Bangor Auditorium. The win also gives veteran Penquis coach Tony Hamlin not only his 401st career victory, but his alma mater’s first state title since 2000 when the Patriots also defeated Boothbay in the final. “It’s really unbelievable,” said Hamlin, who is pondering retirement after a 31-year coaching career highlighted by three state titles overall, including a Class A crown in 1983 at South Portland. Andrew Hallinan paced Boothbay with 16 points while Anthony DiMauro added 15 as the Seahawks had their typical fast-breaking ways largely held in check. Lyford and Bess combined to made 20 of 26 free throw tries overall, and the Patriots made 17 of 26 tries in the fourth quarter alone as Boothbay increased its defensive aggression in a bid to carve into a nine-point Penquis lead. Bess scored 12 points to lead Penquis to a 25-17 halftime advantage, with his four field goals coming on three 3-pointers and a monstrous two-handed dunk off a baseline drive. Bess’ two-pointer was the exception to the norm early for the Patriots, whose first six baskets came from beyond the arc as they erased an early 5-0 Boothbay lead. Cody Herbest added two 3-pointers while Lyford hit the sixth as Penquis shot 6 of 11 from long range over the top of Boothbay’s 2-3 zone during the first two periods. “Coach had a bit of an idea that they might play zone so he stressed that in practice and were ready for it when we came out,” said Bess. 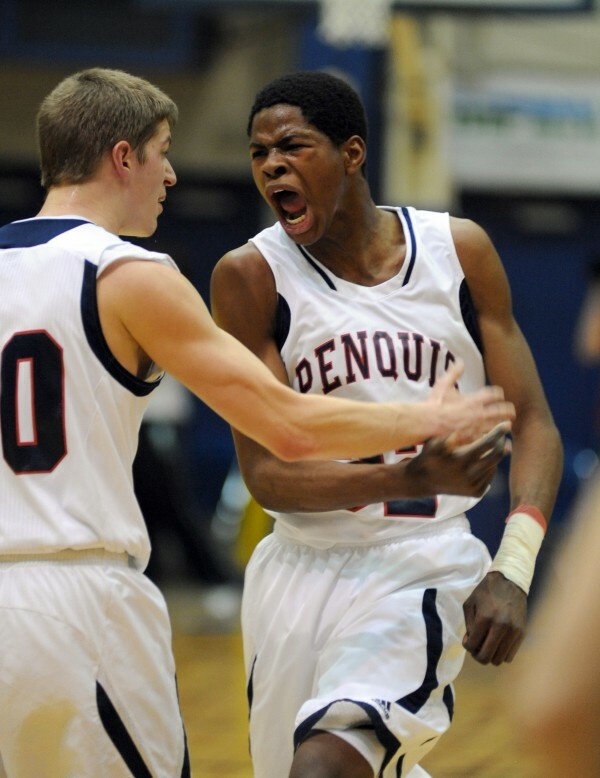 Penquis took the lead for good at 9-7 on a Herbest 3-pointer with 47 seconds left in the opening quarter, then Bess converted a four-point play after being fouled as he made his second 3-pointer to give the Patriots a 13-9 lead at the end of the period. Penquis extended its first-half cushion to as much as 21-9 on its first two-pointer of the game, a low-post basket by Derrick Johnson that ended a 15-2 Patriots run with 5:36 left in the second quarter. Lyford finished the half with four assists and four rebounds while holding DiMauro scoreless until he secured his only first-half points on a short jumper from the lane with 50 seconds left in the period. Bess maintained the offensive intensity into the second half, scoring his team’s first six points — highlighted by a thunderous dunk off a backdoor pass from Lyford — to help Penquis stretch its lead back to 36-23 midway through the third quarter. Penquis briefly switched to a 2-3 zone after Lyford picked up his third foul, and DiMauro was able to get untracked and score the final two baskets of the period to draw Boothbay within 40-31. Lyford made six straight free throws early in the fourth quarter as Penquis pushed its lead to 47-34, but as the Patriots began to work on the clock Boothbay amped up its halfcourt defensive pressure and went on a 10-1 run to pull within 48-44 on a follow-up basket by DiMauro with 4:26 left. Penquis made just 5 of its next 10 free throws to give Boothbay an additional opening, and the Seahawks got within 55-54 with 37.7 left on back-to-back 3-pointers by Hallinan. Lyford then made two free throws before Bess stole the ball near midcourt and finished off the layup to give the Patriots a 59-54 cushion with 28 seconds remaining.